The British War Medal was instituted to mark the end of the First World War. It was awarded to officers, men and women of the British and Imperial Forces who left their native shore to serve overseas between 5th August 1914 and 11th November 1918 inclusive. It was not imperative for the recipient to have entered a theatre of war. There were 338,000 British War Medals awarded to Australians. The Victory Medal commemorates the victory of the Allied Forces over the Central Powers. It was awarded to prescribed classes of persons who entered a theatre of war on duty between 5 August 1914 and 11 November 1918 inclusive. There were 336,000 Victory Medals awarded to Australians. The 1914-15 Star was awarded to those who served in specified theatres of war between 5th August 1914 and 31st December 1915 inclusive. The 1914-15 Star was not awarded alone. The recipient had to have received the British War Medal and the Victory Medal. There were 82,000 1914-15 Stars issued to Australians, mostly to troops who served in New Guinea, Gallipoli and Egypt. These three medals were sometimes referred to as Pip, Squeak and Wilfred, with Pip representing the 1914-15 Star, Squeak the British War Medal; and Wilfred the Victory Medal. * Williams, Reginald David 2000, Medals to Australia from 1858-1999, with valuations, Downie’s, Melbourne. Image courtesy Orange City Library. 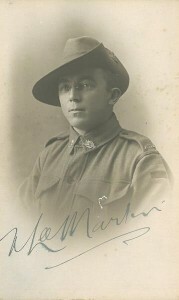 Norman Lee Martin was born in Taree in 1899. He was working as a manager of the Dubbo branch of John Hunter and Sons’ boot business when he enlisted in October 1916. Norman entered camp in Dubbo, then embarked HMAT Benalla in Sydney in November 1916, arriving in Devonport in January 1917. He proceeded to France in May that year, a Private in the 3rd Infantry Battalion, 23rd Reinforcements. In October 1917 Norman suffered a gunshot wound to the right thigh, and was hospitalised in England. He returned to Australia in March 1918 and settled in Orange. In January 1920 W.E. Agland and W.F. Satchell nominated Norman for the Orange Municipal Council elections held on 31 January. Despite receiving 399 votes he was not successful. On 8 September 1920 Norman married Mary Clarice Eade at the Orange Methodist Church. The couple remained in Orange for several years, moving to Sydney in the 1930s, firstly to Milson’s Point, then later to Belmore. Norman had two brothers who also served in World War One; Clarence William Martin (who lived in Newtown) and Percy Wilfred Martin, who was killed in action at Gallipoli on 1 August 1915. Leader, 10 September 1920, p. 8. * With the diggers 1914-1918, 1933, Fourth Division AMC Association, Melbourne. Born in Rockhampton, Fitzroy Brand was living there and working as a clerk for the accountant Joseph Kenna when he enlisted for WWI. A Private in the 26th Battalion, Brand embarked from Brisbane in January 1916, proceeding to Alexandria and then France. He received several promotions during the course of his service, and was appointed Lieutenant in March 1917. Fitzroy returned to Australia in July 1919, settling in Orange and marrying Jessie Machin in 1928. The couple had two daughters, Margaret and Jennifer. A prominent public figure in Orange, Fitzroy held several positions during the 1930s and 40s including President of the Orange sub-branch of Returned Soldiers and Sailors’ Imperial League (RSSIL), President of the Orange Diggers’ Race Club and Manager of the Orange Producers’ Rural Co-operative Society Ltd (OPR). Bertie Ruben Cantrill was the seventh of 12 children born to Albert Edward Cantrill and Louisa Jane Moaer. He grew up on his parent’s property, Strathnoon, at Borenore, and was educated at Nashdale Public School. Bertie enlisted in June 1918. He was living in Parkes at the time and working as a carrier, carting wool for the railhead at Forbes. He was discharged prior to leaving Australia. In July 1922 Bert married Kate Connell from Forbes. They started a window cleaning business in Sydney with Kate’s brother Hugh and his wife Ann, but later returned to the Central West, settling in Leeton in the 1940s. The couple had three daughters, and one son. John ‘Jack’ McPherson Caldwell was a farmer on the family property on Cargo Road when World War I broke out. He enlisted in April 1916 and embarked in September the same year. Initially a Private with the 5th Reinforcements of the 14th Machine Gun Company, he was promoted to Corporal in January 1917. Jack was captured and held as a German prisoner of war at Limburg from April 1917 until January 1919. He returned to Australia in May 1919. Jack was a prominent local identity in Orange. He was elected to Canobolas Shire Council in 1942, and a year later appointed President, a position he held for many years. In 1949 he was elected President of the Shires Association of NSW, having been Vice-President for the preceding two years. Jack was also President of the Orange branch of the Country Party and a member of several other organisations, including the Orange Show Society. William Daniel McNab was a farmer at Borenore when he enlisted in October 1916. He was initially a Private, then a Trooper, with the Camel Corps; and was later transferred to the 4th Light Horse Regiment, where he was promoted to Lance Corporal. McNab was hospitalised in January 1917, suffering from mumps, then again in May 1918, having sustained gun shot wounds to his legs. At Sasa on 30 September 1918 (when a party of Germans were holding up the Advance Guard and inflicting casualties on our men) this H.C.O., a Hotchkiss gunner, quickly grasping the situation galloped around to a flank under heavy fire, sent his horse to cover and taking up an exposed position absolutely regardless of personal risk fired his gun until the enemy fire was silenced, thus enabling the Advance Guard to proceed without loss of time and a minimum amount of casualties. Throughout all operations this H.C.O. has shown great courage and devotion to duty. McNab took up a soldier settlement block near Narromine following his return from the war. In September 1924 he married Ruby Euphemia Ponton in Sydney; the couple settled at Bogan Gate, moving to Milton in the 1950s, then Sydney in the 1970s. William was living in Hurlstone Park when he passed away in June 1989. William’s name appears on St John’s Presbyterian Church Orange Honour Roll. Roy Luke Cantrill was born in Orange in 1898, the youngest of nine children born to Joseph Cantrill and Sarah Ann Richards. The family were living in Trundle when WWI broke out, and Roy enlisted in March 1916, aged 18. He embarked in Sydney in September 1916 and proceeded to France in December, a Private in the 19th Battalion. Cantrill Street in Trundle was named in Roy’s honour. His name appears on the Honour Roll at the Soldier’s Memorial Hall in Trundle, alongside that of his brother, Matthew, who also served during WWI. Western Champion, 12 April 1917, p. 23. Born in Bourke in 1891, Claude Bertie West was living and working in Orange as a clerk when World War One was declared. He enlisted in August 1914 and embarked in October the same year. Initially a Driver with the First Field Ambulance in France, West was transferred to 4th Infantry Battalion in Egypt, and later France. Claude was promoted to Lance Corporal in February 1916, Corporal in August 1916 and 2nd Lieutenant in January 1917. West was wounded in action in France on 11 May 1917, receiving several gunshot wounds to the face, chin, thigh and leg. He died five days later. A keen footballer, the Leader described Claude as “one of the most popular young men in Orange”, and “one of the best three-quarters in the west”, his services being always in demand when an important match was to be played. Claude West is commemorated on the Holy Trinity Church Orange Honour Roll, the Orange Railway Ambulance Rifle Club Honour Roll and on the World War I Roll of Honour on the southern face of the Orange Cenotaph. In July 1917 a tree was planted at Orange Public School in Claude’s memory. It was one of 26 trees planted in honour of fallen soldiers who had attended the school. In 1923 the Anzac Memorial Avenue of trees was planted along Bathurst Road to commemorate fallen WWI soldiers. A tree was planted in honour of “Lieut CB West”; it was donated by FF Hubbard. Very few of the trees are still standing today. [Francis Frederick Hubbard was the father of Francis John Hubbard, whose wife Beryl was Claude’s sister]. Claude’s brother Jack Hilton West also served in WWI in the 34th Battalion. Leader, 21 May 1917, p.5. Leader, 21 February 1919, p.5. Jack Hilton West was working as a bottler at Walker’s Brewery when he enlisted in February 1916. He embarked in June the same year and served as a Private, later Corporal in the 34th Battalion, 3rd Reinforcements in France. Private West has set a fine example of endurance and courage to the men of the battalion frequently under the most trying conditions as a signaller and linesman. By his willingness and total disregard of danger he assisted in keeping communication throughout the battalion. Jack returned to Australia in August 1919. In 1921 he married Nellie Valerie Gardiner; the couple had two boys, John and Don. Don served in WWII; he was killed in action in Bougainville in May 1945. Jack’s name appears on the Holy Trinity Church Orange Honour Roll. Jack’s brother Claude Bertie West also served in WWI; he died of wounds received in action in France in May 1917. Leader, 23 February 1916, p. 2.